January is coming to a close, and all around the world animals have been dying left and right. No one seems to know why, and many theories have been mentioned but if you ask me, everything that main stream news is reporting about these incidents is a straight up lie. Someone knows whats going on, and we aren't being told the real truth. 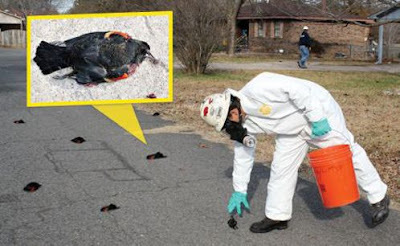 The first animals that started dropping dead for no reason were the 5,000+ birds that dropped dead in Arkansas. It was New Years Eve when this happened, and immediately on the news they were quick to mention multiple times that there was nothing to worry about, and it was probably because they were spooked by fireworks. Excuse me? When the hell in the history of humanity have birds been so spooked by fireworks, that they fall from the sky? I haven't seen that in any city that I have lived in. This is totally a bold face lie, and a cover-up. The next day when they were cleaning up the birds the government quickly came out to the site, and had hazmat suits picking up EVERY SINGLE bird in the town that had fallen. That was quick wouldn't you say? If only the Government were so adamant about cleaning up after hurricane Katrina. I think it is kind of strange that the Government went and picked up all of these birds. If you ask me I think they know more than they are telling us. I wonder if anyone else has a preserved carcass that isn't related to the government. If the government did do something biologically to these birds, or tested some type of new biological weapon, the only proof that there would be is in the birds themselves. I think they know this too, thats why they had these guys picking up every single bird, not just the birds that were on the street. Lets not forget folks birds decompose and help the soil. However, if they have been contaminated by a biological agent, or are proof of a government experiment, then they must be taken care of, and destroyed. I don't believe they are studying a damn thing on those dead bird bodies. They are destroying the proof of there sinister experiments. If that wasn't weird enough 1000s of dead fish ended up washing to shore along the Arkansas River. 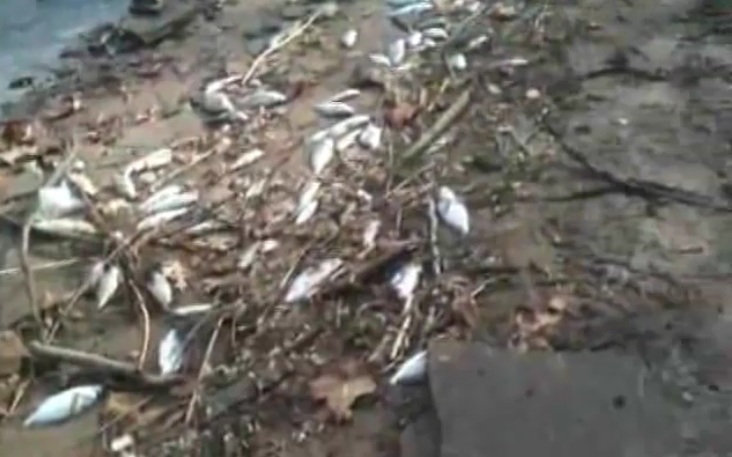 Arkansas Game and Fish organization is baffled, and say that the fish that they found alive seemed very very sick. They claim that they have sent some specimens to the University of Arkansas in Pine Bluff for testing. The only fish that ended up dying were the Drum fish. The catfish, bass, and other fish are just fine in the river. How could a disease target just one species? I think this is more proof of the same type of experiment from the dead birds. Notice how in both cases a specific species was almost targeted and eliminated in a specific area. Is this a new weapon of some kind? Is it a result of HAARP experiments going on in Alaska that can cause weather changes, and really ruin someones day? Your guess is as good as mine, but all I have to say is don't believe what main stream news is throwing in our face as an explanation. This just doesn't happen, especially so close together. 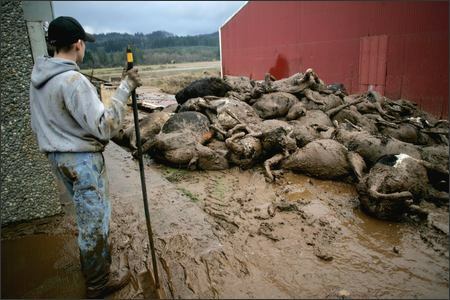 In Wisconsin there were 200 dead cows found on a farm. The farmer called in a veterinarian that said that it could have been because of a virus, or pneumonia. I personally believe that this is still a targeted species in a specific area, that was eliminated due to a test by the government. This stuff doesn't just happen. All of these things occurred in January of this month. I can't just not do a post about it. Could a specific group of people in a target area, be the next target for a new weapon that we just do not know about? It is entirely possible. I didn't do this post to freak anyone out, I just want people to think about these cases with an open mind, because mass deaths are obviously a serious thing, especially when government officials and medical professionals claim to be baffled. Oh but don't worry they all say we have nothing to worry about and they are isolated incidents. I hope everyone prepares themselves for what is to come. Please leave comments and let me know what you think. i believe it man. crazy sh!t is happening and we need answers but we will never get them if all of us never stand up and demand an answer.